Don and I spent a wonderful weekend in Rochester! When we arrived Saturday morning Callidora and Beauty flew over us in Aqueduct Park. Don rushed back to the car to get the camera and they both flew low enough that I put my binos down and just enjoyed watching them! We stayed in the Aqueduct Park area most of the day, sitting under the trees and out of the sun. We were joined by Dana, Carol, Jeanne, and Brian. Jim D. also popped in for a bit. It was great to see Callidora make her first OCSR I-beam landing, after several attempts to scope out the precise logistics of an I-beam! Sunday morning we went to the bridge where Dana, Dan, and MAK were watching. This was the morning we watched Callidora and Beauty in a food exchange. We all knew it was coming, because Beauty flew around, prey in talons, looking for Callidora. Archer offered to take the food, but Beauty was saving it for Callidora. Carol, Dana, and Don were clicking away with their cameras, while I just enjoyed watching mom and daughter! It was awesome! This is the link to the photo album Don put together of the exchange. Hope you enjoy it. It was a very warm day in Rochester, NY today, high near 90 degrees (F). After leaving work at 3:30 pm, I went in search of Callidora, Beauty and Archer. Especially Callidora, because she hadn’t been seen that morning. I quickly found Archer and Beauty together on the top I-Beam, south side of the Old Changing Scenes Restaurant. A quick drive around to the north side and there was Callidora on the top I-Beam on the north side. Yay all three! I decided to settle on the Andrew St. Bridge to keep an eye on Callidora. At approximately 4:30 pm, Callidora took off flying north over my car, heading for the gorge. I grabbed my binoculars and saw that the brewery pigeons were up! and Callidora was calmly flying in their midst. I jumped into my car and got myself over to the east end of the pedestrian bridge as quickly as I could. I was so afraid that I would miss her! I parked my car, grabbed my camera and binoculars and made my way out onto the pedestrian bridge. Callidora was still flying above the Genesee Brewery, but she was heading north, down the river. Drats! Thankfully, I didn’t have to wait very long for her return. For about 15 mins, she entertained me, chasing pigeons, diving on gulls, swooping down the gorge wall, over Skye’s bldg. It was just like it used to be with Mariah and Kaver’s fledglings. This is what I had been waiting for. I quickly texted out that she was in the gorge, but no one was able to join me. Here’s just a little bit of what I saw. Callidora eventually headed back towards the city (south), flying over the river and the buildings along the way. She chased pigeons and anything else that flew into her path. Eventually she landed very low on the Frontier communication tower. Later in the evening, I was joined by MAK, Dana and Lou. Before it started to rain, we had the pleasure of watching Callidora, Beauty and Archer flying together over Midtown, HSBC and Xerox. Callidora was very vocal as she chased her parents around the area. Just as it started to rain heavily, all three left the area, heading west. I said my goodbyes and did a quick check of the area on the way home. I found one falcon on the top I-beam of the old Changing Scenes Restaurant, south side. I’m so glad that Callidora finally discovered the wonders of the gorge that so many fledglings before her enjoyed. I really hope it won’t be her last visit and that other Watchers will be able to see her gracefully fly above the High Falls. It was a very rainy day in Rochester today and we were under a Thunderstorm watch until 8 pm. The skies darkened a couple times, but thankfully it did not rain. It was very, very warm and muggy. I first found both Archer and Beauty sitting on the north side of the old Changing Scenes Restaurant (OCSR). First one and then the other took off heading north down the river. I thought I heard Callidora crying nearby, but I couldn’t see her. I watched as Archer and Beauty skimmed along the top of the Genesee Brewery buildings, just on the other side of the river from Kodak Office. It looked like they were hunting, trying to scare up the pigeons that roosted there. After a few moments of this, both took off heading east. I drove around the city looking for them without any luck. I returned to the Andrew St. Bridge and found Archer again on the north side of OCSR. MAK joined me and we continued the watch. Archer took off when we weren’t looking, so MAK and I split up and searched. After driving around again and not finding any falcons, we parked on the Broad St. Bridge. Beauty was now sitting on the south side of the OCSR. Archer flew in to the other side carrying prey, something very small. Beauty flew around to join him. Jeanne had just arrived, so I decided to check out the north side of the OCSR. Just as I was parking my car on the Andrew St. Bridge, I heard the familiar cry of Callidora. She was flying around and finally landed on the top I-Beam platform next to the elevator shaft. Archer took off and landed on the base of Mercury. Beauty was two I-Beams up from the bottom. It was time to take a closer look. I walked up to the OCSR and settled in to watch. Callidora continued to cry and Archer flew back and landed on the top I-Beam further down from her. This lasted a long time. A&B would look at C everytime she cried, but they stayed where they were. A quick call to the other Watchers to tell them I had all three and that they should join me. Dan had now joined MAK and Jeanne and they decided to stay on the Broad St. Bridge. At 8 pm, Callidora finally took off. She vocalized quite loudly, flying past Archer. Archer took off and both he and Callidora circled the building and headed east, towards the Xerox bldg. For a few moments Beauty remained and then she too took off and headed east. Since I was now falconless, it was time to head home. MAK reported that after I left, Beauty brought food in after the sun set. It was probably Callidora enjoying a late dinner on the base of the Mercury statue. Joined Dan at 5:29am. Callidora was flying above Xerox. She stooped across river, but never came back up. Found Archer on 3rd I-beam north side OCSR at 7:26am. Beauty was on bottom of FCT (Frontier Communication Tower. Callidora just flew through over me…Man, she is a BIG girl!! At 8:42am Callidora was on rail below Mercury. Callidora stooped off the rail under Mercury around 9:00am. She flew directly above my head less than 20 ft. away! WOW she is gorgeous! Several times she passed over me down low up and down the river scaring all the water foul and pigeons. She went under Court St. bridge and Susan B. Anthony bridge and back to rail under Mercury. No prey was taken,too slow but it was great stuff in this watchers opinion. Busy, busy, busy… 9:25am Callidora chasing little birds on roof of Reuters. She is being very cute. Then off to FCT. 10:09 am Callidora was kakking and she just wouldn’t stop! An hour later she was still there, kakking every few minutes (must be hungry). Carol P took over late afternoon around 4:00 and reported: As it started to pour, Callidora flew in and landed on the base of the mercury statue. She picked at leftovers. At 4:30pm Archer was on top I-beam OCSR southside, and Callidora was still at the base of mercury statue. Callidora flew off towards HSBC. Beauty flew back towards me and landed on the northside of OCSR. Archer still on the southside. Archer checked out downtown at 5:30 and returned to land on northside of OCSR. Loved my pilgrimage to falcon Mecca. It was good to see a fledgling in Rochester again. I just knew Kid Calli would wait for us to get there to show off her newly acquired flying skills. Pictures are coming. And the tattoos are still on! Hubby took a picture of one for the falcon record. I spent all day editing pictures and preparing a video. The falcons are the reason we come together…but it is the people who make Watcher’s Weekend! I had a wonderful time sharing this weekend with all who attended. Thanks to everyone who came from out-of town…great seeing you again! And, it was a pleasure meeting those who joined us for the first time. Bill and I had a really nice time on Saturday-seeing watchers that we had met before and meeting so many new people that I only knew by name on the Forum. We tried fifty ways to Sunday (our GPS was going crazy rerouting us) to get to the Planetarium for the movie and ran into police barricades everywhere! We got so frustrated that we ended up going home earlier than we had anticipated. We watched TV that night to see what was going on and found out that it was the annual Pride parade that prevented us from getting through. Unfortunately, we couldn’t attend on Sunday due to a prior commitment but we want to thank all of you for all that you do. To all the visitors…I enjoyed spending time with you this past weekend. Nice weekend! I think we had almost 15 out of towners and there were some new local faces in the crowd. I tried getting pictures of those who weren’t already in the Falcon Watcher’s album. Hopefully, I got everyone’s name correct. If not, let me know. I think Aqueduct Park worked out great. I knew it was going to be good as soon as the Rochester Falcons themselves gave us a Saturday morning welcome fly-by directly over the river in front of us at exactly 9:00 am. The old pedestrian bridge was nice, but it was as if the new family was formally welcoming us to a new era. And it was nice to be close to the hotels, the restaurants, restrooms, etc. The lunch walk to the Dinosaur Bar B Q worked out well - some people were able to get a table and eat inside (with the air conditioning) and the rest of us just brought our bagged take-out meals back to the park to eat in the shade. The Planetarium trip was somewhat thwarted by the fifteen thousand people blocking the streets near the Planetarium but most people managed to get through the crowds to see the Falcons of Toronto movie. Oh well, we’ll do better planning next year! Saturday night was just plain beautiful though; we couldn’t have asked for a more perfect summer evening. And although I couldn’t avoid getting roped into Brian’s Falcon Dance, Sunday was just as nice! At any rate, It’s a different venue with a different family of birds, but Watcher’s Weekend has always been one of my favorite parts of the season here in Rochester and this year was no exception. Glad everybody made it home safe and sound. Hope to see even more visitors next year! I guess I am the last out-of-towner to make it home. After an easy drive, the predicted thunderstorms that never showed up in Rochester hit here in Vermont. It was a small cell, though, and the sun is out again. I haven’t had time to read through all the posts as yet, so this may have been reported, but I need to add that the “stragglers” spent Sunday afternoon and evening on a nostalgic trip to the pedestrian bridge. We were treated to a visit from a mysterious falcon who flew in from the north. This was followed by Beauty and Archer flying down to check things out. No aggression but definite watchfulness. Since the bridge seemed to be a sort of boundary line, we were positioned for a good show. The welcoming local watchers, the other out-of-towners, the weather, the new location, and the awesome flying all contributed to a memorable weekend. Morning - 6:10 AM Archer and Callidora on HSBC, Callidora eating breakfast. 8:30 - Callidora and Beauty flew over river, then to jail, went behind TS and disappeared. Archer was on OCSR but also has disappeared. 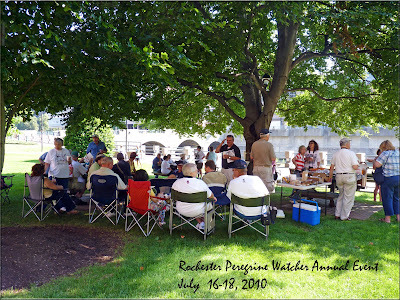 Watchers began to gather again at Aqueduct Park. Callidora was on tall FCT crying. Adult was on short tower. Afternoon - Archer & Beauty on top I-beam OCSR northside. Can hear Callidora above. Many watchers took leave and began their trip home. Here are the pictures I took Saturday. A FUN time was had by all. I only got 2 shots of a Falcon. I leave that to the Watchers with the big lenses. Evening - A top I-beam OCSR southside. Archer and Callidora soaring over the city, higher and higher. Nice flight lesson! Callidora landed on base of mercury. She took off and headed towards HSBC and was spotted on the westside of HSBC…crying. Had a fantastic time Sat. & it was great to meet all the watchers. I had a great time, loved seeing everyone again and meeting new people. Missed some of the flights yesterday, but saw some great family flying this morning and of course, my special Callidora show yesterday morning! Many memories! I just want to say thank you to all the locals. Every year you roll out the red carpet and are the best hosts. But after everything you do daily for the falcons and for us by posting your reports, your fabulous pictures, maps, not to mention all the work on the website and cameras…(I could go on for days! ), I feel like we should be hosting you. Instead you feed us, give us buttons, maps, tags, notepaper… and all we do is show up. Thank you isn’t enough. You are a very special community, welcoming and generous. Thank you! Thanks for a great time! Between the amazing hospitality of the local Watchers, the great city of Rochester, and the falcons, all three of us had a wonderful time. Fireworks, breakfast, companionship, and falcons — that’s all one really needs. I’ve got about a half hour of videotape to process. That;s going to take a while. I also have a few still pictures of Beauty and Archer on the Old Changing Scenes restaurant that I can post now. There is much mention on rfalconcam of the “I-beams” on Changing Scenes. 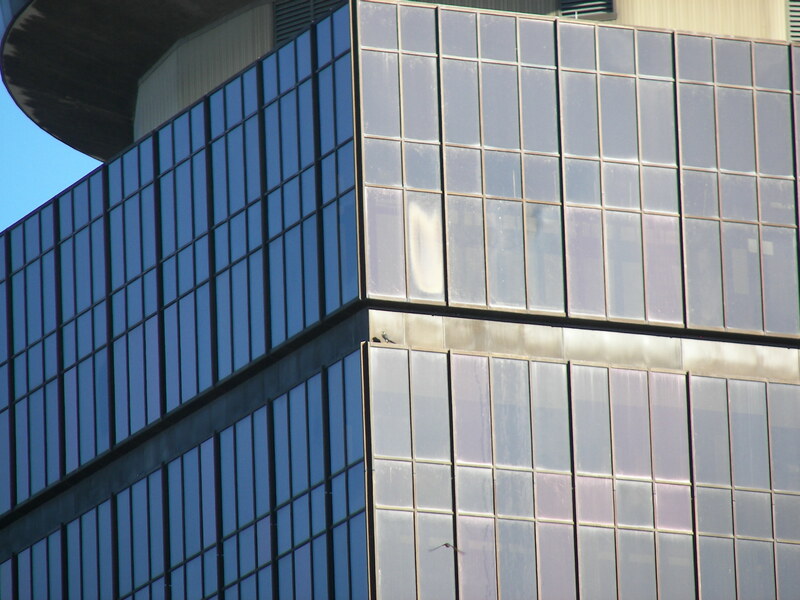 Our room at the Radisson was a great place to view Changing Scenes, so here are the I-beams, complete with falcons. I also added a shot of the nestbox from our room. This is what the falcons see as they fly to the box. After this weekend, I have a much better feel for the world of the Rochester Peregrines. I hope that my edited videos will help people who were unable to attend to get a similar understanding. A big, “Thank You” to all the Watchers– both local out-of-town — who made this weekend so special. It was so great to see everyone!!! So glad we have these weekends! Glad you all made it home safe! Thank you all for coming to Rochester to visit with Archer, Beauty and Callidora! New birds and a new place to get acquainted with. It was so nice seeing old and new friends that share our love of these magnificent creatures. You all make this such a warm and friendly place to visit. Thanks for letting us know that you’ve arrived home safely. I hope that you’ll all be able to return next year. Take care. It was really good to meet all the out-of-towners. I’m kinda sad that watchers weekend is over. It sure was alot of fun with everyone. I hope you all return next year and more out-of-towners who didn’t make it can join us. Glad to hear everyone is getting home safe and sound. 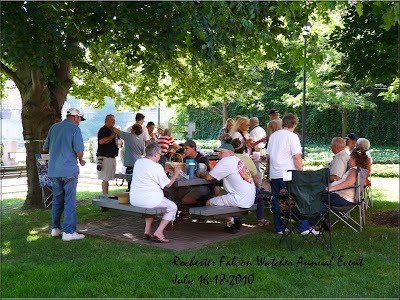 Roger and I met many of the fantastic Rochester falcon-watchers this weekend at the Saturday breakfast in the park. More watchers arrived after these pictures were taken. I wish they would all move to Buffalo! Callidora was spotted bringing her breakfast to the event which she ate from a building next to the park! Later, two pefas were seen flying overhead before they disappeared behind the buildings. We hope Callidora’s brother Jemison can soon join her and give the dedicated falcon watchers a wonderful treat! Thanks for the great time, Rochester! Morning - 6:15 AM Callidora flying above the Xerox, Dan said all 3 were flying around there for 1/2 hour. The morning began with no falcons, then 2 on changing scenes. Then Wendy and I went over to the garage looking for either watchers or falcons. Saw neither for a while, then just a glimpse of a falcon who flew from behind OCS to behind a building. So Wendy and I decided to go over to the pedestrian bridge (around 7:30). Again, no watchers and no falcons…until…. We hear a bunch of little birds twittering and Wendy says “I guess I’ll just do some regular bird watching, since there are no falcons”. I turn to see the birds she’s talking about and silhouetted against the sun is this bigger bird…”Wendy, what’s that? !” It was Callidora! She gave us our own private show - it was awesome! She chased the little birds for a while (right over our heads! 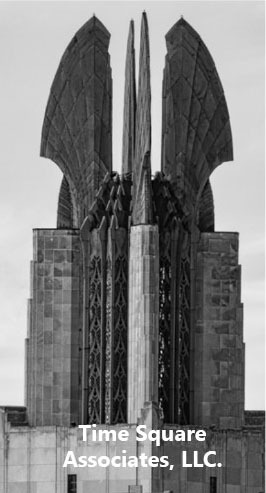 ), did circles around the gorge (wish we had been on the observation deck - she was real low over that), stooped on a seagull, did a circle around downtown then landed on the communication tower. A little after 8 she headed back downtown and so did we. I can see some watchers starting to gather at the park for the breakfast (I recognize Brian, Kapi and others whose names I can’t remember). I’ll be down there soon! 900 AM - Watchers Weekend is launched with a BANG! Archer, Beauty and Callidora with a food exchange over the river! What a great way to start! The Tailgate Breakfast was a success! Everyone had fun getting a tattoo. Watchers occasionally spotted a falcon flying. Archer landed on OCSR second I beam far left. Afternoon - Archer still on northside OCSR. Beauty and Callidora on FCT in the red below platform. Too hot for much activity. Watchers take a break and head out to the Planetarium. Due to traffic re-routing because of a parade on East Ave, all access was blocked and several didn’t make it to the shows Falcons of Toronto & Dolphins. Evening - Beauty on top I-beam southside OCSR. Archer on top I-beam near elevator shaft northside OCSR. Beauty and Callidora soaring together. Callidora over gorge and loving being a peregrine. 8:30 PM Callidora stooped on and chased a duck down to the river. Watchers got quite the show! Woohoo! Callidora then landed on Widows Walk. At 9:00 PM two falcons were on the eastside of Xerox - one was Callidora settling in for the night. Morning - started with all 3 on Midtown. Beauty flew right over Pedestrian Bridge over watchers heads. She is molting, missing a feather on each wing…easy to ID in flight. At 7:03 AM Callidora was on base of Mercury eating, feathers flying. Beauty landed minutes later. No Archer. Beauty under NE wing Times Square (TS). Callidora still on Mercury, food dangling from her beak. She just took off and went behind Xerox building. Afternoon - All 3 flying over Broad St. Archer went towards jail. Beauty landed on Mercury’s foot. Callidora on the base. Beauty took off with Callidora close behind. Flying lessons began all over downtown. Callidora remained downtown. Beauty hunted over river and landed on 2nd I-beam northside of Old Changing Scenes Restaurant (OCSR), also known as First Federal Building. One falcon on Frontier Communication Tower (FCT). At 2:48pm MAK, Brian and Ei on South Ave. garage: Callidora and Archer on Frontier Communication Tower. Evening - 5:10pm Beauty & Callidora dining on FCT. Archer on OCSR. Watchers gathered on South Ave garage. Archer gave a great aerial display over watcher’s heads. Then all three were spotted flying above gorge. More watchers arrived to see Archer and Callidora flying around Xerox. 9:00 PM Beauty flew in with a huge bird in her talons. It was so huge she was struggling! Watchers didn’t think she would make it to the top of Xerox but she did! Beauty & Callidora at top of Xerox. Met up with MAK at City Hall. She graciously drove me all around town until we FINALLY found Beauty and Callidora on the Jail Communication Tower. Callidora is GINORMOUS! They took off to the east & we followed. Found Callidora (and Beauty hiding) on HSBC. Jeanne, Shaky & Carrie joined us. C did some beautiful flying-you could just tell she was flying just because it was fun! She and Beauty played some talon tag then flew way out east then back. Around Xerox…scared up some crows. Eventually Archer came in and we saw all 3 flying together! Archer took off west…Beauty took a trip out east then suddenly showed up on Midtown…then Callidora took off way to the west. At that point it was getting too dark to see. It was great to meet MAK & see Jeanne, Shaky & Carrie again! Can’t wait to see the rest of the gang & meet some new friends!